There are many ways to show your appreciation to a significant other, friend or family member. Often times, both parties may struggle to look for something special to do. 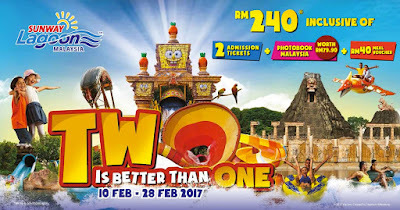 Look no further as Sunway Lagoon is bringing an adrenaline rush to all visitors from 10 th to 28 th February 2017 in their exciting 2 Is Better Than 1 campaign! Celebrating the month of February, Sunway Lagoon invites the public or duos to face their fear of heights together! The 2 is Better Than 1 package is priced at RM240 for 2 persons which include a RM40 Food and Beverage voucher and digital 6” x 6” mini square soft cover photobook voucher worth RM79 (applicable for online purchase only).